Located on a narrow strip of land on South Bass Island is the world famous 352' tall Perry's Victory and International Peace Memorial. The Monument is among the tallest monuments in the United States and is also considered a Lake Erie Lighthouse, although it does not fit into a typical lighthouse classification, there is a flashing beacon on top and serves as a navigational aid. "Dear General-- We have met the enemy and they are ours, two ships, two brigs, one schooner and one sloop. Yours with great respect and esteem, O.H. Perry "
The Memorial was established to honor those who fought in the Battle of Lake Erie, during the War of 1812, but in equal part it is symbolic of the long-lasting peace between Britain, Canada and the U.S. Situated 5 miles from the longest undefended border in the world. Monument Construction began in October 1912, opened to the public on June 13, 1915 and became a National Park Service Memorial in 1936. The name was changed in 1972 from the original Perry Victory Monument to the Perry Victory and International Peace Memorial to recognize the continuing peace between the United States and Canada. A Canadian flag flies next to the American flag at the memorial. 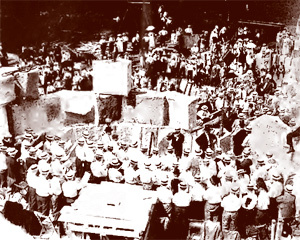 Masonic exercises being performed at the laying of the corner stone of the memorial on July 4, 1913. The Ohio General Assembly originally purchased the land for the park and then ceded title to the United States government. The architect and designer of the Memorial was Joseph Freedlander of New York who was selected through the largest architectural competition ever held in the United States or Europe. Judges were members of the National Fine Arts Commission. 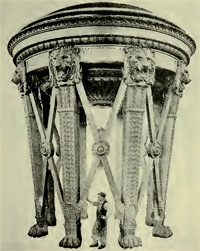 The column is topped by a huge bronze urn and an observation deck for visitors. The tower is one of the tallest in the world of its kind. An elevator takes visitors to the open-air, 360 degree observation platform, but visitors do have to climb a narrow stair to reach the elevator room. In 2006, a 500 pound piece of granite from the top observation platform fell and punched a hole in the plaza floor 317' below. No one was injured, but it did close down the observation platform. This accident forced the closing of the observation platform and the plaza to visitors. Once the platform was repaired, it reopened, but the plaza is still closed. 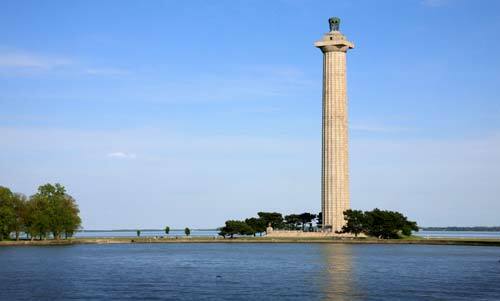 Plans are underway for a complete renovation of the almost 100 year old monument, set to begin in 2009 so it will be completed in time for the Bicentennial Celebration of the Battle of Lake Erie in 2013. 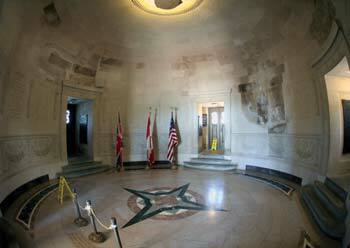 At the center of the base of the massive column is a domed room where 6 bodies are buried from the War of 1812— 3 are American and 3 British officers killed during the Battle of Lake Erie, on September 10, 1813. 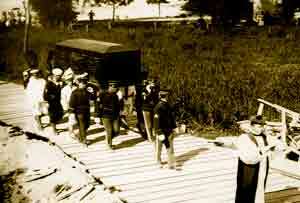 Their remains were originally located where the village of Put-in-Bay is now located, but were moved and re-interred in the crypt at Perry's Memorial on September 11, 1913. Today, there is a marker in Put-in-Bay honoring their original resting place. The illustration at left was done by Benson Lossing for his book "The Pictorial Field-Book of the War of 1812" published in 1868. Not only did Mr. Lossing visit many of the important battle sites, he also interviewed many of the survivors of the conflicts. 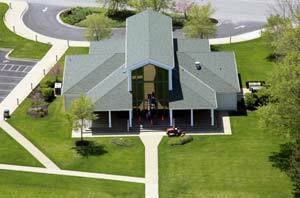 The Perry's Victory Visitor Center was opened in May of 2002. The visitor center has a small movie theatre, a large exhibit area, a gift shop and public restrooms. Visitors can watch a free movie about the Battle of Lake Erie and the War of 1812. Beginning in August 2009, the National Park Service will be closing the observation deck of the Peace Memorial as well as the monument itself that will last for 2 years. 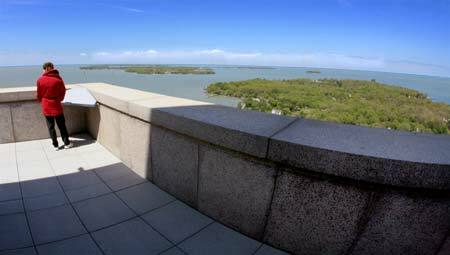 During this time repairs will be made to the observation deck as well as making improvements to the rest of the monument. The goal is to have the structure renovated, repaired and ready for the 200th anniversary of the War of 1812 and the Battle of Lake Erie that took place near South Bass Island in September 1813 during the war, said Blanca Alvarez Stransky, superintendent of the national park that contains the monument. Other than the $7 million needed for repairing the observation deck, it is hoped that an additional $19 million would become available from the much debated stimulus package. If those funds become available to the National Parks service, then the repair list would be expanded to include re-pointing some of the pavers on the upper and lower plazas, the public areas around the base of the monument that currently are fenced off and waterproofing the basement of the monument, located below the plazas. 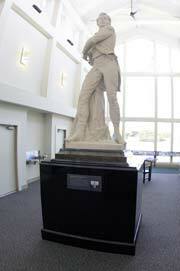 Located dramatically in the center hall of the Perry Memorial Visitor Center is a statue of of Oliver Perry created by Columbus born William Walcutt in 1860. The statue was shaped from Carrara Marble and is 9' tall not including the base. The statue was first displayed in Cleveland's Public Square where it remained until 1929. 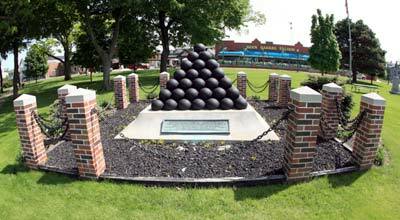 It was then donated to Perrysburg, Ohio (just south of Toledo along the Maumee River) where it was placed in a small park at the center of town along the river. In the 1990s, fearing further detrimental weathering of the marble statue, the original marble sculpture was moved to its present location on loan from Perrysburg. A replica of the original marble statue was created in bronze was put in its place in Perrysburg. 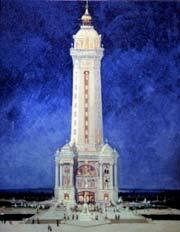 There was a contest for the design of the Victory Monument and Cleveland Architect, John Eisenmann submitted his design. Although Eisenmann's design did not win, his suggested location for the monument on the isthmus of South Bass Island was chosen. John Eisenmann was perhaps better known for his other design: the Ohio State Flag.